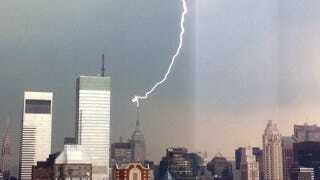 A lightning just struck the antenna spire of the 102-story, 1,454-feet (443.2 meter) tall Empire State Building during a storm in New York today. As usual, the skyscraper didn't suffer any damage. It is not as spectacular as the Statue of Liberty's lightning, but I love these shots anyway. The Empire State's Art Deco spire was designed to be a mooring mast for zeppelins. Passengers were going to check in at the observation deck on the 86th floor. Then they would have taken a special elevator to the 102nd floor, where they would have boarded the dirigible. It never happened. At the end this proved too dangerous because of wind drafts, so the idea was abandoned. Later, in 1953, the radio mast was built on top of the spire.